Like an essay built around the regular insertion of aphorisms. 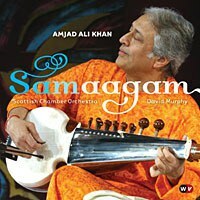 "I have had a great desire to create a Sarod Concerto for the longest time," says Amjad Ali Khan in the album booklet. Khan is a master sarod player from the city of Gwalior in central India, one member of a generational male line of hereditary sarod musicians. His family credits one of its ancestors with the development of the sarod out of the Afghan rubab, which operates at a slightly more soprano pitch. "I have always admired the richness of European Classical music," he writes. But a European classical concerto needs a European classical orchestra. Enter a Welshman. David Murphy, born in Pembrokeshire, conductor of the Scottish Chamber Orchestra, has an interest in Indian music, and the SCO has a programme called SCO Lab, which allows for the creation of experimental fusions, compositions, and so on -- additions to the orchestra's main repertoire. They named their project Samaagam, which comes, explains Murphy, "from a Sanskrit word meaning "confluence" or "flowing together."" There are several things "flowing together" on this album: one, the different groups of musicians; two, the separate musical cultures, European classical and classical Indian; and, three, a "bouquet" of 12 ragas, which have been united, interpreted, and -- breaking with the tradition of structured improvisation -- formally notated, for the concerto. Khan opens the album with a trio of distinct traditional ragas, played in short form for seven to eight minutes each, "Bhupali", "Bhairavi", and "Khamaj". The Orchestra isn't with him yet, and he's accompanied only by tabla. We're being primed. Those three ragas will turn up again at the end of the main piece, holistically integrated. Now "Samaagam" begins. The orchestra lifts itself in chords, a flute comes in, then the sarod. Khan plays a few notes, the orchestra makes a comment, he plays, they come in again, they switch back and forth; the afterdrone of the orchestra hums under him as he plays another three notes, the violins swirl off, and we're away. This sets the pattern for the rest of the disc. Khan initiates a single line of musical thinking, a thin needle going forward into darkness, and the mass of thicker sound surges in to fill the space and make the line elaborate, separating it into parts for strings, for brass, for flute, teasing it apart and flying away, coming back, stirring, tasting, cornstarching it into gravy, a contrast to the reverberating tang of the sarod. The effect is complementary, not clashing -- it's like an essay built around the regular insertion of aphorisms. But Khan is the star and the orchestra is his accompaniment, romantic yet not independent, never free of him, always haunted, always turning its eyes back to its guide. Khan, on the other hand, could be free if he wanted to, that's the impression you get. I heard part of "Samaargam" for the first time in an online video of live concert footage -- the piece debuted at the St. Magnus Festival in Orkney two years ago and went on tour after that -- and at first the album disappointed me because the live playing seemed more impassioned. Listening to this accurate and clear recording is a different kind of pleasure, not the pleasure of hearing a racing panting living bulk, but the pleasure of being able to discern each bit of the teasing-out individually, hearing each moment calmly and platonically captured. "The Concerto was recorded in a beautiful church in Edinburgh over a few days," Khan tells us, "and it was truly a terrific experience."